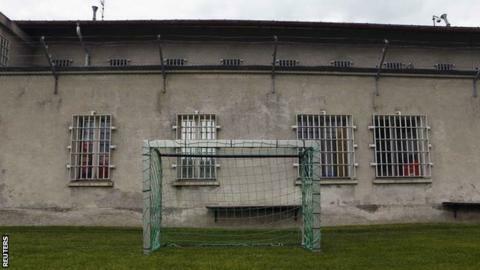 More than a third of all Premier League and Football League clubs have agreed to be part of a programme to help tackle the UK's reoffending rate. The Twinning Project aims to pair clubs with their local prison to deliver coaching and refereeing courses. Founded by former FA and Arsenal vice-chairman David Dein, the new initiative has attracted 32 clubs so far. Justice Secretary David Gauke said: "I am delighted to see so many clubs supporting this wonderful project." The rate of sign-up surpassed Dein's initial target to have 20 clubs at launch and discussions are ongoing to further expand the programme's reach among the remaining 60 clubs. The programme is backed by the Government as well as the Football Association, Premier League, English Football League, the Professional Footballers' Association, match officials body PGMOL and the League Managers Association. The first courses are expected to begin this spring. The project will be open to men, women and young offenders in custody with the aim of preparing participants for release and finding future employment. Mr Gauke added: "Rehabilitation should be at the heart of every prison and although I am clear that offenders are sent to prison as punishment, they should leave with it having been a real turning point in their lives." Prisons Minister Rory Stewart said: "I am hugely grateful to David and to the community departments and the clubs themselves, who have invested their time and money in engaging with offenders and helping them reintegrate into society and lead more positive lives." Premier League: Arsenal, Bournemouth, Brighton, Cardiff, Chelsea, Everton, Fulham, Leicester, Liverpool, Manchester City, Newcastle, Southampton, Tottenham, West Ham. Championship: Aston Villa, Brentford, Charlton, Doncaster, Leeds, Millwall, QPR, Rotherham, Stoke. League One: Bristol Rovers, Plymouth, Rochdale. League Two: Bury, Exeter, Lincoln, Notts County, Oldham, Tranmere.